Carver Dog Park – 2010.10.06 | Tortoise Productions, Inc.
My final major commitment is done for the year and now I can get back to what I love… That and get back to work I’ve been putting off for way too long! Every once in a while a photographer must go out into the world and do something they wouldn’t normally do – take some risks they normally wouldn’t take. In my case, this week I decided to do something I had done plenty of times before, but take the risk of carrying my “real” camera gear with me. And as my dog Kaylee really needed some good exercise, we headed off to the dog park! At this particular park, Wednesday is a less popular day (weekends mornings seeing the most traffic). But as it was a beautiful fall day, we got lucky and the longer we stayed, the more people showed up with their dogs. Keep your eyes open! There is high potential for damage to occur to yourself and your equipment! The dogs that frequent dog parks aren’t going to be careful around you simply because you are carrying big-buck equipment (how would they know?) — and they WILL want to know what that thing you keep pointing at them is! (bring lens cleaning cloths to get rid of nose prints and dog saliva!) Always keep your camera strap wrapped firmly around your hand and be aware of your surroundings at ALL times. I’ve seen many a person knocked off their feet by a dog speeding after a toy/dog/imaginary creature and have been bruised by many a paw, head, nose, hip and full body collision myself. Dogs don’t always respond well to the “camera up to the face” mode of taking photographs. On this trip, Kaylee studiously ignored me if I was looking through the viewfinder and called for her to run to me. A better method is to hold your camera down near the level of your knees and, with the camera set on continuous focus – shoot blind. While it leads to many shots that are obvious throw-aways, you can also get some interesting ones. Always try to get the camera down at the dog’s level to take your shots – holding just your camera down will prevent you from getting pounced on by curious canines! In your zeal for getting those “Dog having a great time” close-ups, don’t forget the environment shots. 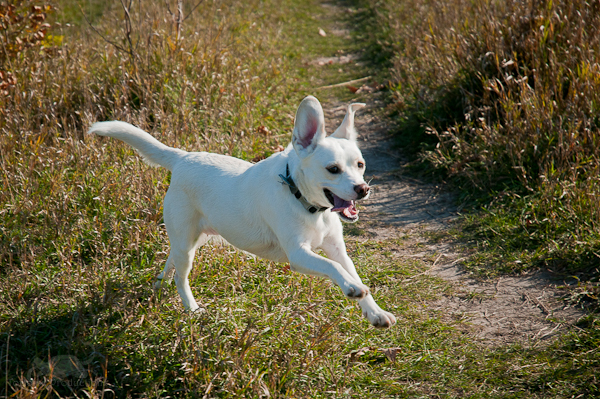 And most of all – have fun and enjoy watching dogs enjoy some time when they can run free! Held: Open year round, 5 AM to 10 PM. $5 permit required. Great pictures! I’m hoping to go on the dog park photo shoot next weekend. I’d really like to go to this park. It looks great. Awesome post, animals are the best.